Feeling peculiar? You will after you've read "Hollow City"
Quirk Books have established themselves as the sort of publisher who don't dally with the mundane and everyday stuff. They like to dance in the darkness, embracing a backlist of titles that I'd quite happily stuff my bookshelves with. I reviewed "Miss Peregrine's Home for Peculiar Children" a while ago, describing it as a darkly delicious treat that left me craving more. With book 2 I wasn't disappointed. (Please watch out below for spoilers if you've yet to read the first book...!) 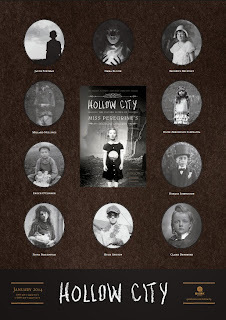 Ransom Riggs swaps curiosity and discovery for a hell-for-leather mad scramble into the unknown in "Hollow City". Miss Peregrine's rag-tag bunch of "Peculiars" are left devastated by wight attacks after book one, and Miss Peregrine herself - a powerful Ymbryne - is seemingly stuck in bird form, unable to transform back into a human. Jacob, the teenage boy central to the plot in "Miss Peregrine's Home for Peculiar Children" leads the rest of the peculiars to seek out the one remaining Ymbryne left - Miss Wren.